The term vision insurance is commonly used to describe health and wellness plans designed to reduce cost for routine preventative exams and prescription eyewear (i.e. eyeglasses and contact lenses). These plans have established a relationship (or network) with providers of vision eyewear and medical services. 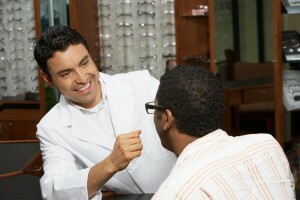 This allows their policy holders to receive exams and purchase eyewear at reduced prices. Many of these plans provide discounts for elective corrective surgery such as Lasik. The National Eye Institute estimates that more than 11 million people in the U.S. have uncorrected visual impairment. Vision coverage is not mandated by the Affordable Care Act as required health coverage for adults. It also not required coverage for Medicare Supplements or Medicare Advantage plans. Regular eye exams are important for early detection of cataracts, glaucoma and macular degeneration. These exams also can detect other health conditions like high blood pressure, diabetes and high cholesterol. For more information about vision plans offered by Humana, United Healthcare or VSP you can contact Wanda Stephens at 919 845 6001 or click here. You can also compare premiums, benefits and discounts by clicking on the links below.